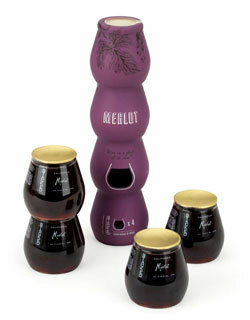 STACKED’s exclusive Vinoware container was designed by engineers to offer the look and feel of a wine glass. Vinoware is made with a high-quality plastic that is shatterproof and lightweight, while also protecting wine from oxidation and spoilage. With STACKED’s Vinoware, every glass is sure to be fresh! This seems like a great idea, if the wine is drinkable. There are lots of single-pour bottles available, usually inexpensive wines sold in four-packs, but one still has to have a wine glass. That’s fine for home, but not so convenient for picnics or the beach. Somewhat similar products have been created before, though in a different form factor. Five years ago we wrote about “instant wine glasses” in the UK. Stacked describes their wines in glowing terms… The Merlot, they say, has “just enough complexity,” ” tasty fruit flavors like red plum, red raspberry and cherry,” “a soft cedar and tobacco note,” and “a mellow tannic structure.” Not bad for a plastic cup of wine. We haven’t found this product in stores yet, and Texas is one of the few states their online distributor doesn’t serve. If anyone tries this, please post a comment and let us know how it is! I would like to purchase white wine in stackable wine glasses! Wondering where I may purchase these as they would be wonderful Christmas gifts for friends.